Sure, making a starter is cheaper than buying multiple vials of yeast, but the accuracy, scheduling, and waste of fermentables bothers me. However, it may seem like a necessity to better approximate the pitch rate required if you don't have a microscope. I don't think any one will disagree when I say that yeast is a major cost contributor to the beer. So what's a better way to get the ensure the correct cell count for your beer? For a 5 gallon batch of a standard ale with an initial gravity of 1.060, 200 billion cells are required. There are several ways this can be achieved. One concern you may have with this method is infection. Because a large percentage of the wort remains for 24 hours without being inoculated the chance that something else may get a head start is a possibility. However, if you make sure to sanitize everything, there should be no issue with holding the wort for a day before pitching. On brew day sanitize two fermentors. Chill the wort and pour half into each one. Pitch the yeast into your primary fermentation vessel, and seal both containers. The following day, just like a starter, your yeast will have grown significantly. Pour the wort from the second container into the primary fermentation vessel. As a bonus, pour as vigorously as you like. Aeration is beneficial at this stage of fermentation. An alternative to a second pail would be to keep the wort in your boil kettle and seal it up. My boil kettle is a pressure caner, so this is an easy task. If you are using a traditional kettle you may need to get creative. An alternative would be to pour the hot wort into a large expandable water container as done in the no-chill method. It's that easy. No starter make or clean. No delicate scheduling to ensure you have enough cells on brew day. There is only one more thing to sanitize which should take an insignificant amount of time when done in parallel to sanitizing you primary fermentation vessel. Apparently this is similar to a German technique known as "Drauflassen"
Great Post and idea! I do have a few questions - When using this method do you still aerate and/or oxygenate the first "half" of the wort. If so, do you use the same rate as you normal would for 5 gallons? After the 24 hours, when you add the additional wort, do you oxygenate then? Have you tried this method before and compared it to the same recipe with say two vials? I'm wondering about how this method could change the finished beer. I haven't tried it with the same type of beer. Because there is an increased number of cell divisions that occur during fermentation I was leery that there may be increased off flavors. However, recently I made a stout with this method and it came out great. It was cleaner tasting than I expected with grain flavor that came right through and no off flavors. A better test (than a stout) would be a clean lager. This is a very interesting method. Does it only work for a doubling of cell count? Or will it work for more? Say for example I'm making 5 gallons of 1.060 lager, calling for an initial cell count of ~400 bn. Could I add 100 bn cells to 1.25 gallons of aerated wort, wait a couple of days, and then add the remaining 3.75 gallons? Or would I need to do the above-method in three stages: 1) pitch into 1.25 gallons of aerated wort and wait 1-2 days; 2) add 1.25 gallons of unfermented wort and wait another 1-2 days; 3) add remaining 2.5 gallons of unfermented wort and ferment as normal? Yes, it will work for a 1.060 lager as well. The way you have it is correct. Pitch 1/4 of the cells into 1/4 of the wort. The lowest that this works for is one 10th of the wort. Blog post on that coming up as well! I tried this method for a Munich Helles I brewed this weekend. I pitched 1 pack of Wyeast 2308 into about 1.5 gallons of oxygenated wort (probably slightly underpitched), and put the remaining wort into a sanitized container to wait. I'll dump the remaining wort into the inoculated fermenter in a day or two. I hope it works! Thanks again for the really interesting blog. After two days at 50*F, I dumped the remaining ~3.5 gallons of wort into the 1.5 gallon "starter" that I made. All indications are very good so far. After one week at 50*F, fermentation appears to have been quite active. There is a lovely layer of kraeusen on top of the wort, and I am already at 80% of expected attenuation. No apparent off-flavors in the hydrometer sample, and I have raised the temperature to 65*F for a diacetyl rest. I will post additional notes after fermentation completes and I rack to the keg to begin lagering. That's great! Thanks for the updates! Fermentation completed in less than two weeks with no noticeable off flavors. I racked to a keg to begin lagering, and then harvested the yeast (as suggested elsewhere on this site, by simply pouring into several sanitized mason jars). The yeast looks and smells quite healthy. Obviously that is a subjective, non-scientific measure, but I am so far very pleased with the results of this little experiment. In a couple of weeks I'll pitch about 1/4-1/3 of the collected slurry into a Maibock that I'm planning. Once that’s completed I’ll have made 10 gallons of lager from a single smack-pack, with no starter! To update the results of my experiment, after several weeks of lagering, there is a distinct diacetyl aroma/flaver to my Helles. I don't know whether to attribute this to slightly under-pitching my "starter" beer, an insufficiently-long diacetyl rest, or an infection. I didn't detect any diacetyl in my Maibock (pitched onto half of the stored Helles cake) when I kegged that, but we'll see how it tastes once that has lagered. I don't have enough large fermenters to split a 9g batch in half each time if I already have beers fermenting in some of my vessels. 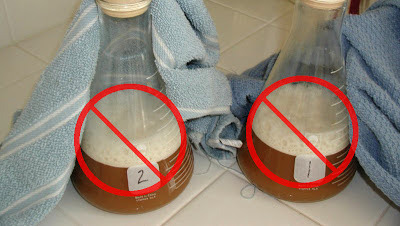 It would be easier for me to instead take a gallon or two of the wort and put it in a small container (like a growler or other small vessel) for the quasi-yeast-starter. It seems that this should work, yes? Is there a problem with simply taking 2L of the wort and putting it on the stir plate like I would a starter, then pitching that into the rest of the wort in 24-48 hours? Absolutely! The way the equations work out, 1/10th of the wort can be used to make a starter with the correct number of cells for the whole beer. I call this "The Two Step" There is a post coming up with all the details. Well 2L isn't quite 1/10 of the batch size, but that's why I asked about just putting it on the stir-plate, because I figured cell reproduction would go way up on the plate. I don't have any growlers or 1-2G containers ATM, so the 2L wort starter might be the best idea for me, and I like that it's part of brew day instead of a carefully pre-planned thing, DME, etc. My mistake. I thought you suggesting using a gallon or two as the starter. From looking at what Kai has done recently it seems a stir plate will get you roughly twice as many cells as a normal fermentation, so that approach should work. So, if I understand correctly, you pitch the yeast into half the final volume of wort. After 24 hours, the yeast count has doubled, then you add the other half volume of wort. Why wouldn't the yeast count double if I pitched into the full volume of wort? You are correct that the yeast would also approximately double in 24 hours if pitched into the full volume of wort. The benefit to pitching into half of the wort is that it prevents under pitching.